Much talk is given to the European traveler's transportation dilemma: Train or Car? It's a tough one. So, why not chuck the whole idea? How about an itinerary that is done almost entirely in boats: Venice to Patras, Greece, to Whatever Islands Strike Your Fancy. Venice stands out in Europe as Serenissima, the "Most Serene Republic." Although the Serenissima went up in flames some time ago, the romantic idea of traveling to Venice in hopes of experiencing a serenity that transcends the grueling pace and political detritus of modern life is still alive and well in the city slowly crumbling into the lagoon. In some sense, the Greek islands also provide Serenissima as well. Isolation, sun and sea, and an unhurried lifestyle all contribute to a vacationer's sense of serenity. So, can you relax and do it all by boat? Well, sort of. It's possible to be ferried from the docks of Venice to Patras, the last Adriatic ferry stop in Greece, without getting in a car. From there you'll have to take a bus or the train to Piraeus, the port of Athens, or to Athens itself. In Piraeus, you can find ferries to most islands. Don't know the islands or island groups? Martha and I made this trip several years ago. It took longer then; we spent two restful nights on the boat. And this ferry was different than other, shorter ferries. There weren't a lot of passengers lying about the hallways, nailing down a place to sleep without paying for a cabin. There were good restaurants on board. The whole deal seemed more like a cruise than a freighter hauling sweaty human cargo off to be buttered up and set down on an island to roast. What's different now? Well, the newer boats are almost twice as fast. You only need to spend one night and the better part of the next day on the ferry before you land in Greece. 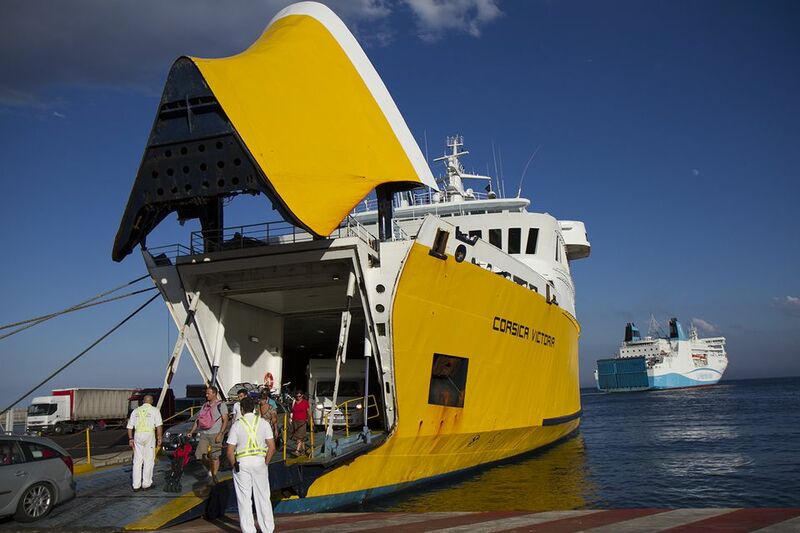 Greece Ferries currently offers an overnight fast ferry from Venice to Patras. You can also take two nights by going on the midnight ferry and ending up in Patras early in the morning. the total time at sea is about 31 hours. Patras is rather isolated, but all ferries from the Adriatic stop here. These days, it's not a bad place to spend a night, but you don't have to. You have to use the bus or train to get to Athens or Piraeus, the port of Athens (ask the purser on your ferry for bus info). In Piraeus, you can get boats to many islands. Most boats to Patras stop at Corfu, which is worth a few days if you have the time. A round trip ticket will save you up to 30euro over two one-way fares. There may be other discounts for seniors and students. You can get a private cabin for two, but sometimes it's possible if the boat isn't full to get two berths in a larger cabin for less and still maintain your privacy. (Each bed in a four-bed cabin costs less, and sometimes they'll put a couple in two of the beds without filling the other beds--and you can save considerably via this method). Bicycles are free on some ferries. You can make the Adriatic crossing from other places in Italy like Ancona, Brindisi, and Bari, but they involve travel to some pretty boring destinations before your ferry ride (although the old section of Bari is very interesting). Go-ferry Venice to Patras page with pricing. Greece Ferries also has a Venice to Patras sailing. Of course, if you're in a hurry, don't need to transport a car, and get seasick, you will want to fly. The flight takes a little over 5 hours. Can you drive between the two cities? Well, yes. It's 1,169 miles through 7 countries. 20 hours of driving time if you drive like a maniac. And then you have to find a parking spot.